Everybody has a "Pokey Tool" for when the paint dropper bottle gets clogged. However, I don't. I have been using a wall push pin, which is not very effective. I've seen other pokey tools. In fact, many people at ReaperCon 2014 bought the metal skull pokey tool which had a very nice weight to it, but it just wasn't my style. I fully admit, I like cute things with big eyes like I'm five years old and it's ingrained into my very nature. (I'm half-Asian, or technically, "Pacific Islander" if you're filling out bubbles on a standardized grade school test). Regardless, I made up my mind long ago that my miniature painting pokey tool should be cute. 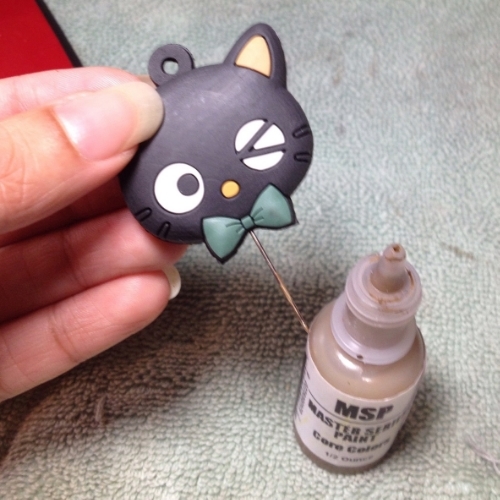 And I have yet to find one after two years of painting, so I decided to make one myself using Sanrio's Chococat key holder and a pin. I started out using a pin from my old sewing kit and quickly realized the plastic ball on the top just wasn't going to work. The top warped the key cover and removing the ball wouldn't allow the super glue to adhere properly. So I dug around in the depths of my old sewing supplies and found my magnetic pin cushion. I needed a T-pin to be able to glue the flat, wide surface area to the inside of the key holder. 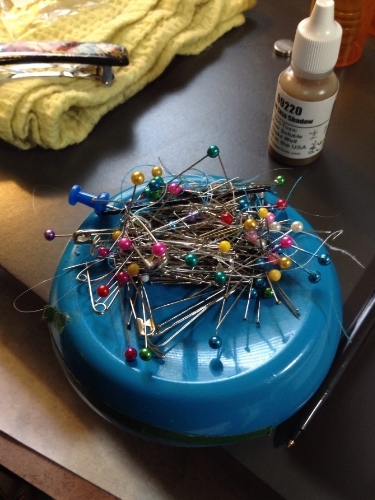 Unfortunately, finding a T-pin proved difficult-- kind of like finding a needle in a... well, needle stack. After suffering only one minor puncture wound, I found a T-pin and prepped my final supplies. 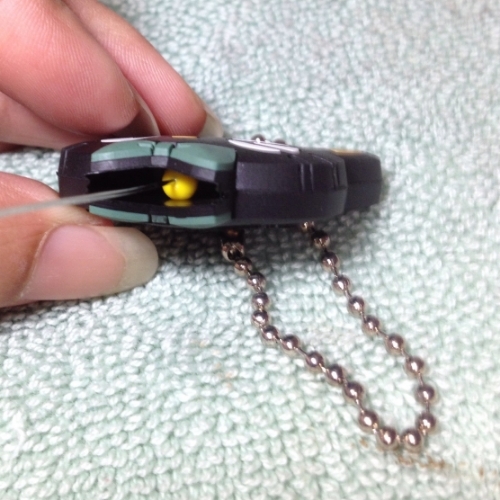 Once I applied super glue to the top part of the T-pin, I placed it inside and centered it, leaving about 25% of the T-pin inside the key cover. Then I held it together until the glue set, about 1 minute just to be safe. 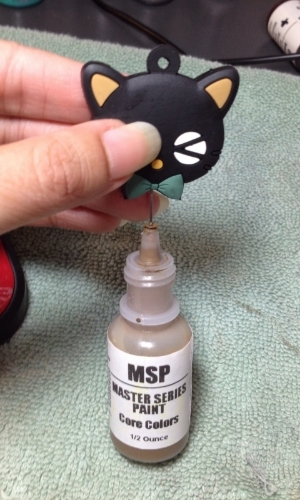 I love this picture-- it looks like Chococat is grimacing because I'm smooshing his face while the glue dries. Then I let it sit on my desk for about 5 minutes. Next, it was time for the final test! I gathered a stubborn dropper bottle of paint and hoped for the best! Success! Not only did the super glue hold well, the rubber key cover was incredibly comfortable to grip (unlike pins without handles) and it came away cleanly after poking through the top of the stubborn paint bottle. I'm very pleased. Not only do I have a cute & unique custom pokey tool, I can replace the chain and hang it on a peg by my desk for easy access. Brilliant. If you're thinking about making your own miniature painting pokey tool, consider using a T-pin and a key cover/key holder. Or create something similar out of clay, push T-pin into the center before baking in the the oven until set. Then, remove your new pokey tool and let it cool. As long as the clay isn't too thin around the T-pin, it should offer enough support as a pokey tool. Give it a try & share your results with me! Everyone needs a "Pokey Tool" and why not have yours reflect your own personal style?